Here are 5 ways to get on the right track for a solid paid social media strategy. As brands are being compelled to turn to paid social, with organic really being forced and downgraded by platforms, it becomes important to remember some basics to getting paid social strategy right as you go. Yes, paid social does offer a far better targeting opportunity, but with hugely increased paid social traffic and increased competition, the costs can really spiral out of control. Because more and more brands are targeting the same hearts and minds (and eyeballs) of consumers, campaigns can get derailed, and the cost per intended action get sometimes really get out of control. What becomes important here is targeting strategy and getting it right. And, doing it different from what the competition is doing. If your competition is after a typical demographic, and that's how they target, it's wise for you to focus on some other way – maybe different interests amongst your audience, or different sets of behavior. No matter how you target, getting your creative right is critical. You can only cut through all the noise that the competition is creating with stand out creative that appeals to the right audience, in the right context, and at the right time. Naturally, you'll need to do some serious A/B testing (or even multi variant testing) and optimize your creative according to the results – and this needs to be done in continuum – throughout your campaign's lifecycle, so your message stays on top. It's important to set clear goals for your campaign – particularly when you are putting money behind it. Make sure that every one involved, and/or every one that has a stake in the campaign across multiple departments knows what the expectations are – and that goals reflect overall strategy, not just what the sales department, or the PR department is after. Share what metrics you will be measuring success against ahead of time, so every one knows what the campaign is up against. Set clear KPIs and make sure that they cover what the overall goals are. Influencer marketing – particularly when under the umbrella of paid social can get really tricky – specially because they can play havoc with budgets. Influencers most often have their own social strategies, and your brand has to work with the way they operate across multiple platforms – and usually not the other way around. And again, you need to define for every one how you look at the results of influencer via social – is that earned media, is that paid? At the end of the day, you and the entire team with you (including the ones making the budget decisions and the heavy marketing decisions) need to understand that influencers don't come free, and no matter how much they can do for your brands social results – you are paying for it. So, in that sense getting influencer strategy right in important for paid social. 5. Who's paying for paid social? Who owns it? 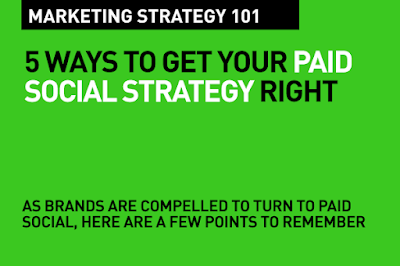 That's the final part of paid social strategy. Who is really paying for it and what are their goals? Is it the overall marketing team that's responsible for the paid social budget? Is it PR? Is the sales team paying for a one-off campaign? And are the paying stakeholders aware of the pros and cons of paid social? Do they really know the potential power of it? Have you walked them through the strategy, the goals, the KPIs, the metrics of success measurement and the on-going optimization and performance improvement parameters? No matter who pays for it, someone in your organization needs to take ownership of paid social, and drive it to its best possible outcome. Please share this post and feel free to add your comment. This is right information for people who are doing search engine optimization. I have client for whome I am designing an online shopping eCommerce site, and this article is very useful! There are not so many seo conference events which are being held in the past decades but this forthcoming 2018 there will be a large event that will definitely help bring up a good outcome for men and women that are working under Online imaginative content.